Video clip synopsis – Bikinians are asked to leave their island to make way for US atomic testing. Broadband MP4 bitter_bb.mp4 (9.7MB), suitable for iPods and computer downloads. Bitter Memories is an excerpt from the documentary The Marshall Islands – Living with the Bomb, an episode of the six-part series The Human Face of the Pacific, made in 1983. “he people of the Bikini Atoll were removed from their homelands as a result of American testing of nuclear bombs in the Pacific. They now live on another island, dependent on American food and support. They can never go back to Bikini Atoll because it is poisoned beyond the possibility of habitation. This film is a poignant, impressive study of a people whose culture has been vanquished. This series is composed of six documentaries covering six Pacific nations and territories, giving a wide-ranging view of contemporary Pacific society. It shows the variety of ways of life from subsistence to urbanization and the challenges from outside to what has been called ‘the Pacific way’. Students examine the ways in which Australians are connected to other people around the world and explore the responsibilities of global citizenship. Students have the opportunity to consider the economic, social and cultural connections of Australian people to other people in the Asia-Pacific region. Students analyse how individuals, organisations and governments can be global citizens. Students investigate ways in which countries cooperate to protect the environment. Students participate in a campaign to raise awareness about a significant issue. Students explore how media and information and communication technologies are used to present issues and influence opinion. 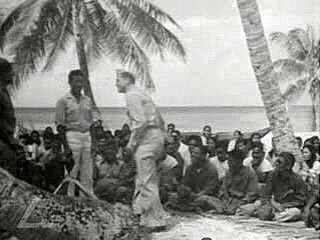 This video clip shows US army members ‘informing’ the Bikinians about the atomic tests about to take place around their atoll and the tests’ apparent benefits for world peace. Kilon, an elderly member of the Bikini community, believes his people may have been tricked into leaving the atoll in the 1940s so the United States could conduct these tests. Following a series of unhappy relocation efforts beginning in 1946, the Bikinians were told in the early 70s that it was safe to return to their atoll. Subsequent medical tests found they had dangerous levels of radiation in their bodies, and they were evacuated once again in 1978. Kilon’s poignant testimonies describe the turmoil of many evacuations and the hardships the Bikinians have endured. By the 1980s, the long-term effects of exposure to radiation had become a very contentious issue. US official findings often diverged from the evidence of the Marshall Islanders but it is clear that the many relocations and the dependence on the United States and its imported foods has produced long term ill-health and anxieties in the population. Confined to a new semi-urban environment, Bikinians fear for the future of their children, who are influenced by American cultural values through television and who no longer know their traditional way of life and culture. The Bikinians have petitioned for compensation from the US Government because of the damage done to their island homes and the negative impact it has had on their health, life-style and the future of their children. In 2001, the Nuclear Claims Tribunal determined damages to be paid to Bikinians. There is not enough cash to honour the award and it is left to the Bikinians to petition the US for more money. A decision is expected to take some years. In December 2003, President Bush signed the new Compact of Free Association with Marshall Islands and Micronesia, worth $3.5bn over 20 years. Despite attempts to clean up the contamination, permanent resettlement on Bikini has not been possible. Using a world map or an atlas locate the Bikini Atoll. Describe the characteristics of the Bikini Atoll before the atomic testing. In your description include landform, vegetation, climate and lifestyle of the Bikinians. What alternatives to Bikini Atoll did the US have at the time to atomic testing? Ask students to investigate if atomic testing has ever taken place in Australia? Locate on a map. Draw up a table comparing the location of the tests with Bikini Atoll, the size of the explosion, the purpose of the testing, the impact on local people and long term effects of the testing. Explore with students in the context of the concept of ‘global citizenship’, the responsibilities, if any, of us as Australians citizens, to the Bikinians. The issues of the use of nuclear energy are currently being debated in Australia. Ask students to do a media watch related to the use of nuclear energy in Australia. Draw up a list of arguments for and against the use of nuclear energy. Are there connections between these reasons and the earlier atomic tests on the Bikini Atoll? In small groups ask students to consider issues about the impact of atomic testing and the use of nuclear energy on the environment -both physical and human. Conduct a survey about the issue in class and use the results to develop an action plan to broaden the debate into the school community.